Tarvine is a small token from the mighty Rei Rea, this time on a fresh 3″ by the label [walnut + locust]. The picture is showing the moon (It may be any other planetary object as well, it also may be just a white circle) surrendering to the triumph of despair, thus preparing us properly to the crushing moments that wait on this CDr. 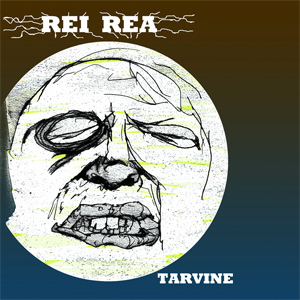 Tarvine is more distressed than the other albums that I have heard from Rei Rea. The sound, heavy and everlasting, seems dirtier, and drags the listeners slowly in muddy lakes of distortion and meditative agony that Christian Dube is skillfully forging for them with machinery that can be clearly heard, on track number four for example. Different forms of haunting, constant rhythm also appear on most of the tracks on this album, charging the world of Tarvine with intense drive and paranoid atmosphere. For twenty minutes, Rei Rea is scratching bones along an endless, echoing, rusty metallic wall. When I heard about this album, I have to say I got excited, looking forward to giving it a listen. Fortunately, Rei Rea does not disappoint those who like his previous work. Instead, he pounds their head on the endless metal plate, and like me, they will say ‘Thank you’ and ask for more.